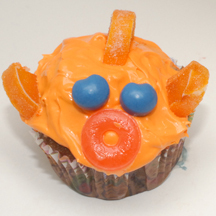 These cute fish cupcakes owe their open mouths to O-shaped Life Savers candies! What You Need: 1 cupcake (baked and cooled); white or off-white frosting; orange paste-style food coloring or red and yellow liquid food coloring; 3 mini candied orange slices; two blue M&Ms; 1 Life Saver. Make That Cupcake! : Tint frosting orange (or actually any color you’d like your fish to be). Add three candied orange slices at sides and back of cupcake for fins and tail. Add blue M&Ms (upside down) for eyes and Life Saver candy for mouth. Create a whole school of these fish for a swim party! This entry was posted on Tuesday, October 9th, 2007 at 5:59 pm	and is filed under animal cupcakes, ocean and sealife cupcakes. You can follow any responses to this entry through the RSS 2.0 feed. Responses are currently closed, but you can trackback from your own site.